Brown and Caldwell, a leading environmental engineering and construction firm, recently announced its selection by the City of Palo Alto to provide design services for secondary treatment upgrades at the city’s Regional Water Quality Control Plant (RWQCP). Operational since 1934 and serving the communities of Los Altos, Los Altos Hills, Mountain View, Palo Alto, Stanford University, and the East Palo Alto Sanitary District, the RWQCP with 39 million gallons per day (MGD) design capacity treats wastewater before it is recycled or discharged to the San Francisco Bay. Upgrades are viewed as a key driver in the city achieving long-term utility performance and value as it manages population growth-driven capacity constraints, heightened effluent quality regulations, and aging infrastructure challenges. Having undergone several expansions and improvements, primarily occurring in the 1970s and 1980s, many assets are now in need of rehabilitation and replacement. “This is another critical project that we are undertaking to upgrade this facility to meet anticipated nutrient limitations, while also replacing equipment, that in some cases, is beyond its useful life,” said Tom Kapushinski, City of Palo Alto Public Works project manager. Brown and Caldwell will provide engineering services during all phases of the $31M project from preliminary design, design, bid period services, engineering services during construction, and support during commissioning and start-up. The four-year project will be conceptualized through energy-saving design principles with the goal of achieving energy use reduction throughout the plant. 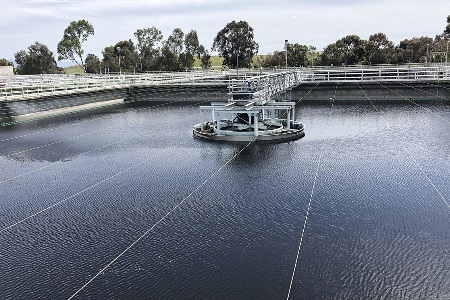 Innovations within Brown and Caldwell’s design include improved aeration and pumping systems and reconfiguration of the treatment process to provide higher quality, energy-efficient wastewater treatment. “We’re at a crossroads with aging infrastructure challenges, population growth, and anticipated nutrient regulations. Embarking on this project is a critical step for us to proactively and cost-effectively address these issues for our community and continue our mission to protect San Francisco Bay,” said Jamie Allen, RWQCP manager. The contract marks a continuation of Brown and Caldwell’s legacy of conceptualizing and designing numerous secondary treatment projects nationwide. Following an 18-month design phase, construction activities are expected to commence in 2020 with the upgraded facility fully operational by spring 2022. Headquartered in Walnut Creek, Calif., Brown and Caldwell is a full-service environmental engineering and construction firm with 45 offices and 1,600+ professionals across the country. For more than 70 years, our creative solutions have helped scores of municipal, federal and private agencies successfully overcome their most challenging water and environmental obstacles. As an employee-owned company, Brown and Caldwell is passionate about meeting our clients’ needs and making a difference for our environment and communities. For more information, visit www.brownandcaldwell.com.